I first met Garry Winogrand at the beginning of 1966. Although I was a dozen years younger than he was, we quickly became close friends and, soon enough, were photographing together on the streets of New York. In the beginning, I found this a little strange; for me, making photographs was something to be done in private, if only because it required such tremendous concentration to have any hope of doing it well. But I soon realized that meeting with Garry and walking the streets with him didn’t mean that I would have to give up the idea of working autonomously: we simply spread out, typically separated by about half a city block, and worked independently. Manhattan was rich enough in photographic possibility that neither one of us felt constrained by the other: there was more than enough to see and be excited by. And then, every once in a while, we could stop and have coffee together and indulge in the pleasure of talking about what we’d seen, usually in the Museum of Modern Art café. 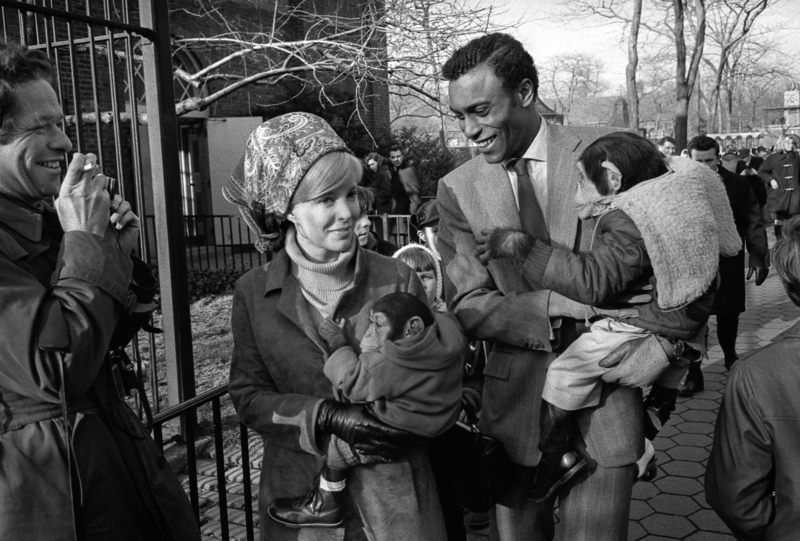 And so, one Sunday, on an early spring day about a year after we’d met, Garry and I found ourselves walking through the Central Park Zoo. I was 20 or 30 yards ahead of him when I noticed a handsome couple walking toward me—they looked like fashion models, in their 20s, both well-dressed—improbably walking with a pair of chimpanzees who were as immaculately attired as they were (the animals even wore shoes and socks). A New York City piece of strangeness, it seemed to me, strange enough to take a picture. So I did. Then, bang!, I felt myself being pushed in the back away from this odd little group. A real shove, unfriendly, hard. And, of course, it was Garry, camera already up, making pictures, who’d done it. Obviously, he was seeing something that I hadn’t seen, and what he was seeing was important enough to him that he was willing—for the first and only time in all the years that I knew him—to aggressively lay hands on me. I was shocked, of course, but once I saw that Garry, and not one of the Sunday strollers rushing by me, was responsible, I forgot about being angry or even irritated: he was my friend, I rationalized immediately, and must have had his reasons for momentarily acting as if he’d never seen me before. By now, both chimpanzees were off the ground (as my picture shows, one had been toddling between the couple when I first saw the group), and I finally noticed that the man in the little quartet was black, and the woman white and blonde. I’d already recorded that fact with my eyes, I’m sure, but what it may have meant, or could mean, in a photograph, was something I hadn’t had the time or the consciousness to process. Garry Winogrand, however, had obviously processed the fact: where I saw only the possibility for a joke that, at best, touched on the crazy-quilt nature of city life, you could say that Garry, by not so much seeing the group itself but instantaneously imagining a possible photograph of it, placed meaning, particularly as it might gather around the question of race, at the very center of what he was doing. In other words, quite apart from whatever Sunday pleasure or notion of self-advertising had actually brought that couple together with those two animals, Garry’s quick mind construed from their innocent adjacency a picture (or the projection of one) that could suggest the improbable price that the two races, black and white, might have to pay by mixing together. He was speculating, of course, playing an artistic hunch, but a large and important enough one that he felt it was worth pushing his friend aside for. So he did what he had to do, and then, a moment later, I answered by making a picture of him standing by the same family group as they continued their stroll through the zoo. As it turned out, Garry never reached a conclusion about whether or not he’d solved the problem, or question, that the picture we’re considering here had posed for him. Although it has become canonical, and is, perhaps, the single photograph now most associated with his body of work, the fact is that, in his judgment, it remained an aesthetic question mark until he died. 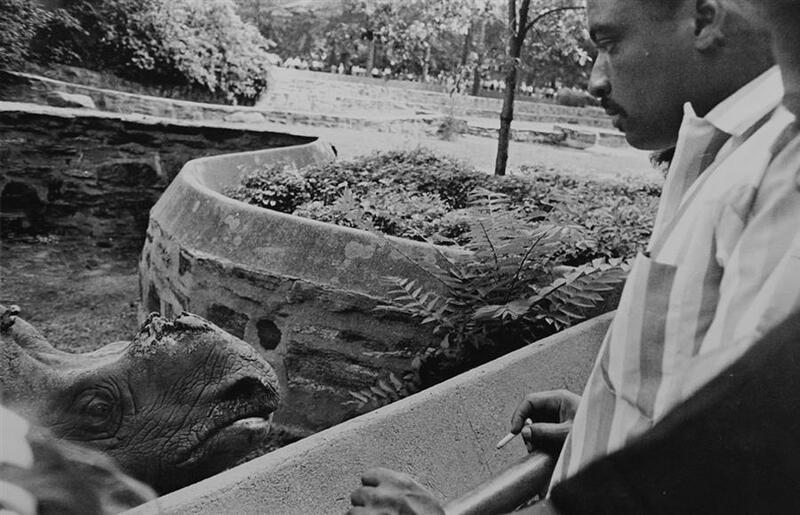 For example, “The Animals,” his first book, comprised of photographs made in zoos, was initially published in 1969, two years after he made the picture, yet it’s not included in the book, a piece of evidence, that, while not conclusive (since John Szarkowski was the publication’s principal editor), at least suggests that he wasn’t sure enough of it to insist that it be added. But he didn’t really worry about such things: there were too many other pictures to think about, too many kinds of lessons in his pictures to unravel and learn from, too many problems put into play as he made them. As he understood it, photography was much larger than he was, and his pleasure as an artist was to unremittingly study it. As I’ve already stated, Garry was remarkably unmoved by conventional notions of success, even artistic success as typically measured by exhibitions and awards. “You learn from work,” he’d say, and, further, “I really try to divorce myself from any thought of the possible use of my photographs. Certainly, while I’m working, I want them to be as useless as possible.” Which, turned around, also suggests that, as he understood the issue, any one of them could be judged a success by virtue of the possible lesson it might teach him. Failure, as much as success, was an irrelevant concept to him. For Garry Winogrand, it was foolish to pretend that a thing and a photograph of it were, in any useful sense, one and the same, and that the photographer could no more than minimally control the way his or her pictures of that thing would look. As he understood it, the lens and its unforgiving memory; the world, full of color and dimension; and the photographer’s own limited ability to absorb all of the information arrayed in his or her viewfinder from edge to edge determined an effect, the photograph, that would inevitably be different from the cause that created it, which is to say, the nominal subject of the picture, wild out in the world. “Photography is not about the thing photographed. It is about how that thing looks photographed,” he said. As a result of this understanding, he came to see that, far from trying to control, or even limit, that difference, it might be embraced as a way of enlarging the meaning of his pictures, by charging them with an irreducible trace of unresolved, still-sparking energy that, from picture to picture, could be seen to embody the very élan vital that prods and pushes us forward in our own daily lives. 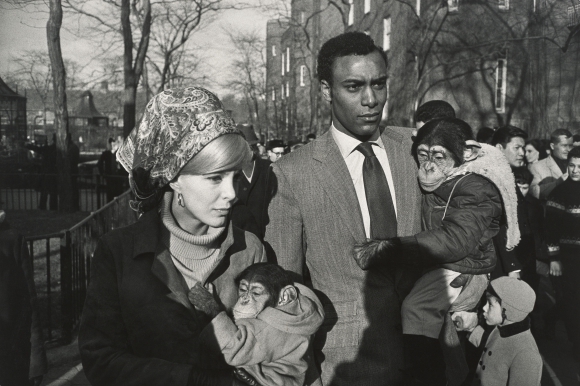 So that, in the end, the picture, in some real, physical sense, re-joins us to life, but life transformed, still palpable in its vitality (always decomposing, always rising) and, by being so, true to the chaos—or “monkey business,” as he often called it—that Garry Winogrand knew it to be. 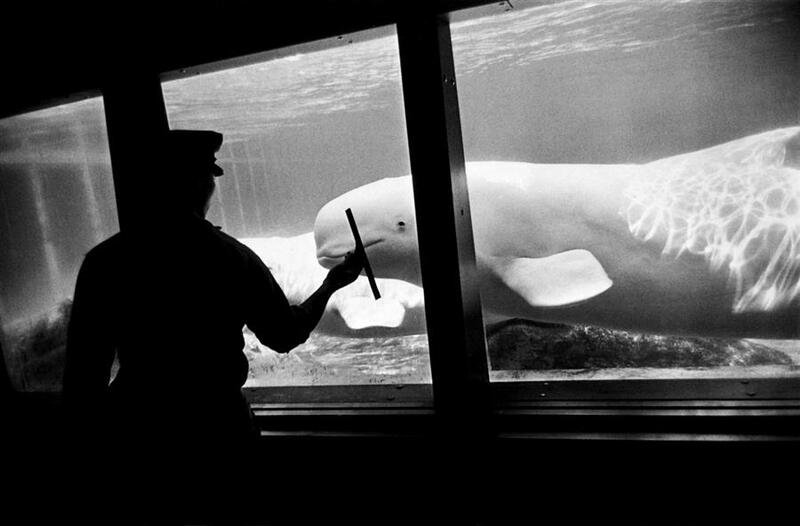 This entry was posted in Famous Leica Users, Leica Photographers, leica street photography, Uncategorized and tagged Garry Winogrand on March 4, 2019 by Leicaphila. Iconic photographer, American as a hamburger, so adept at snatching the essence of the moment. At least it looks like the essence; we don’t really know since we don’t see the before and after. This vignette from Tod Papageorge is revealing about a picture that has always been mystifying. Thanks. As interesting would be to know what became of the couple – both couples, now that I think about it. It’s a photograph that has lingered long; once seen it’s unlikely ever to be forgotten, which points out again that content is king. Wonder what Barthes would have had to say about it… how he might have analysed it from the/his point of view of studium and punctum. Careful Rob, you might start Tim off again. 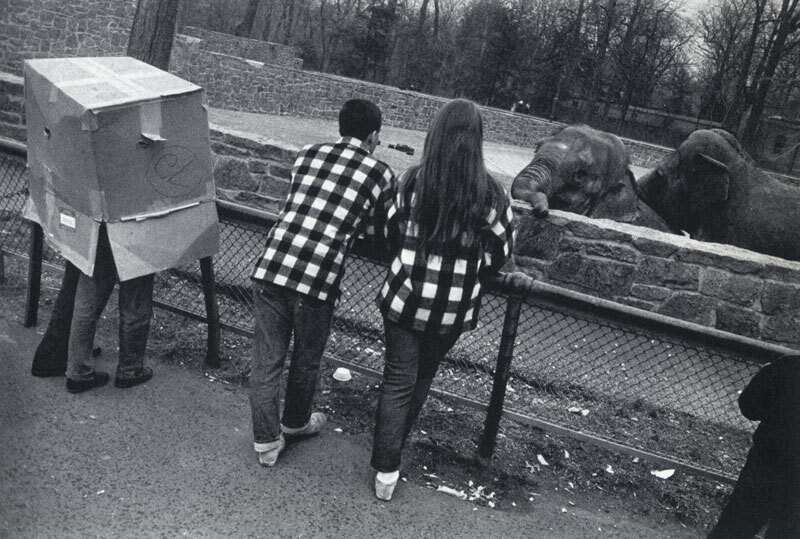 I am just wondering why anyone would visit a zoo in a cardboard box? The main picture and the explanation about how it came about… er, was Garry being a bit of a reverse racialist? Celebrating the moment. Take a picture instinctively, then think about it later, if ever. Winogrand was comfortable with the natural time delay built into film photography, even to the extent that he never got around to developing thousands of rolls before he died, which was long before the advent of digital imaging. I wonder how he might have fit into our smartphone world. Smartphone world: probably taken to it like a duck to water. I don’t think he belonged to any “fine print” lobby, but as usual, as I have never seen his prints in person, as it were, how can I know? I don’t even know if he did his own printing. As I can’t imagine his street stuff generated much income, I suppose he had little alternative to doing his own thing. I rather think that in those times, and for those people, gear wasn’t a subject that mattered beyond that it be reliable, affordable and smallish. Mad Ave. of course, was something else. I always admired Bert Stern, from the moment I saw his vodka ads featured in one of the Popular Photography Annuals; they used to put out two: one called that, and a second publication called the colour Annual. It’s where I first encountered Saul Leiter and, I think, Ernst Haas. It’s also why I find it so annoying when contemporary folks think Eggleston did something amazingly new by using colour film much later on. Guess the same folks never heard about Lisette Model, either. 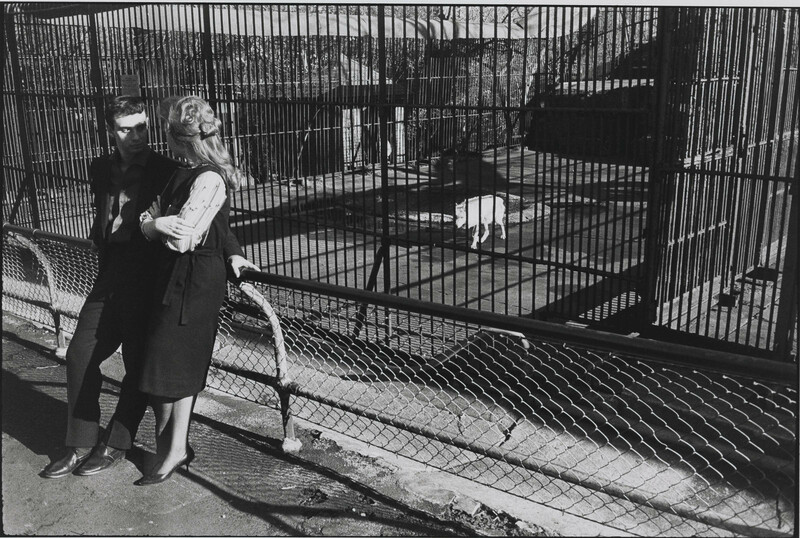 This piece nicely complements the discussion of this photograph in the recent documentary “Garry Winogrand: All Things Are Photographable”. Tod Papageorge, Leo Rubinfein, and others offer some fascinating insight into Winogrand, his photographs, and the era in which he worked. I highly recommend the movie. Heads up to any Leicaphiliacs who live in western NY. “Garry Winogrand: All Things Are Photographable” will be showing at the George Eastman Museum’s Dryden Theatre on Sunday April 28 at 2PM. Looking at the profile of the blonde’s nose and that of the apes put me in mind of one of those silly remarks women make when they look for the first time at a friend’s baby. I, of course, never saw any such thing as did the women.